Second, Title 1's departure from the settled framework above could result in Department of Justice prosecutors serving as pro bono lawyers for private copyright holders regardless of their resources. In effect, taxpayer-supported Department lawyers would pursue lawsuits for copyright holders, with monetary recovery going to industry. In response, the text of S. 3325 has now been updated to strike out the civil enforcement provisions. This is very good news, but other nasty parts of the bill remain. It still has new and extremely broad provisions for seizing property like computers and servers. Such powers are notoriously abused to go on fishing expeditions, and since servers are often shared, people who are not even the targets of investigation will be hurt in the process. It still creates an Intellectual Property Enforcement Coordinator. The title and responsibilities of this position are just as misleading and confusing as the bill, attempting to address issues like copyright and trademarks together when they should be addressed separately. Creating and maintaining this position is a severe misuse of public resources and gets the industry's foot in the door for future malicious action -- like promoting Digital Restrictions Management (DRM). It still creates five International Intellectual Property Law Enforcement Coordinators. These positions are tasked with encouraging other countries to follow our lead, in an attempt to replicate the provisions of this bill and the corresponding industry control all over the world. It still commits $25,000,000 for each of fiscal years 2009 through 2013 as grants to state and local law enforcement for doing "training and education programs." We all know what the RIAA's "training and education" programs look like. We shouldn't be funding distribution of their propaganda. It announces the "Sense of Congress" as agreement with the idea that such enforcement actions should be one of the government's highest priorities, and tries to paint achievement of the entertainment industry's selfish interest as one of the most pressing tasks facing our society. Any senator who agrees to such a statement must be directly in the industry's pocket. We know where Leahy stands -- on his top five contributors list from 2003-2008, we see Walt Disney, Time Warner, and Viacom. Congress should instead be committing itself to investigating the industry's underhanded, abusive and corrupting legal tactics. It's also time for another round of phone calls, voicemails and emails to let our senators know that the bill is still unacceptable. The timing here is critical, so don't worry if it's after office hours -- you can still leave a voicemail. Hello, my name is NAME and I'm a potential voter in STATE. I'm contacting you to reiterate my opposition to S. 3325, "The Enforcement of Intellectual Property Act," sponsored by Senator Leahy. I know that recently the bill was changed to remove some parts that I opposed -- like those that would have had the Department of Justice filing civil suits for copyright infringement against citizens. I'm happy this change was made, but it's not nearly enough. The provisions mandating property seizure are far too broad, and would lead to substantial interference in legitimate work and to intimidation of lawful sharing. The new "Sense of Congress" section sums up exactly what's wrong with the bill -- maximizing the profits of the entertainment industry without regard to the immense negative impact these enforcement actions have on the public interest is the exact opposite of what the government should be doing. Copyright supposedly exists to promote and encourage effective ways to share knowledge and culture, not to inspire hoarding and prosecution. 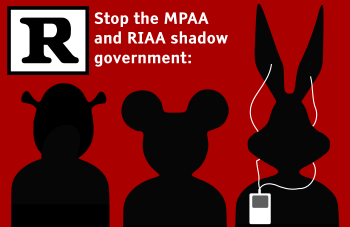 Please stand against the corrupting influence of the RIAA and MPAA, and in favor of the public interest -- vote no on S. 3325. This bill is just one more in the long list of efforts by the entertainment industry to use their wealth and influence to corrupt our government. From the Anti-Counterfeiting Trade Agreement (ACTA) to the Broadcast Flag, they are trying harder than ever to manipulate the law against the public in order to protect their own profits and prevent competition from the rapidly emerging DRM-free culture. DefectiveByDesign will be continuing to expose their efforts and the politicians who assist them. Thanks to our friends at 2600 Magazine for their inspiration for our image on this post.